IntelliCoat’s Model 241H Powder Coating Gun is the world’s first “Intelligent” Hopper Feed powder coating gun. Its patented digital valve control can micro adjust the guns powder output to produce consistent- high quality results. 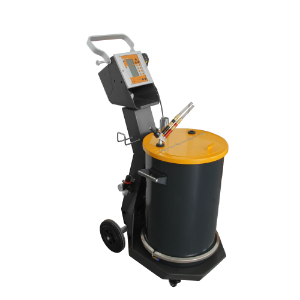 Delivering a full 100Kv of first pass power, it offers 3 pre-set powder coating gun modes for flat work, complex profiles and re-coat operations. And unlike many other powder coat machines, the 241H is fully adjustable allowing for precision adjustments to voltage, amperage, powder fluidization, conveying and dosing air. The flat mode is ideal for coating panels and flat parts and will handle 90% of all your routine powder coating applications with ease. The complex mode is designed for coating three dimensional parts with more complex shapes such as extrusions and parts with deep recesses and uses proven “pulse technology” to combat the Faraday cage effect getting the powder into those hard to reach places. Finally there’s the re-coat mode for the quick and easy way to lay the perfect top coat on any part. Operation of the gun is push-button simple and complete beginners can completely master it in just a few minutes of use. Simply power up the unit, select the coating mode which best suits the piece you want to coat then point and shoot. The gun does the rest. Thanks to its exclusive digital control valve technology the 241H will automatically adjust to the work piece. If further refinements are needed then adjustments can be made either by pressing the up or down buttons on the back of the gun or by pressing the plus (+) or minus (-) buttons on the controller. This hand feature allows you to store up to twenty (20) different powder recipes for all of your most popular coating jobs so you can instantly call them back for use the next time you have more to coat. This feature is great for quality control when more than one operator may use the gun during the day as in the case of a second shift. By storing the settings as recipes, you can safeguard the same quality results time after time no matter who’s holding the gun. The 241H has an extremely easy to use controller making it brain dead simple to take advantage of the powerful technology built into this amazing-next generation powder coating gun. Here’s all you need to do to start coating using the 241H. Lift up the powder fluidizing suction tube and place a box of powder (any size up to 50 lbs.) onto the shaker table and slide the tube back down into the powder box. Power up the unit Select the appropriate coating mode, point the gun at the part and squeeze the trigger . For most powder coating jobs, this will be the only set up you’ll ever have to do. However, should you need it… fine adjustments can be made using the buttons on the lower half of the controller. There you will find precision adjustments for voltage, amperage and air flow. There are also handy on/off buttons for the fluidizer (great when changing colors) and powder to the gun. Another great feature of 241H is its quick color change capability. On average it takes just under 4 minutes to change colors thanks to the clean/purge button located on the back of the gun. Simply turn off the fluidizer by pressing the button on the controller, lift the fluidizer/ suction tube up out of the box, lock in the up position with the thumbscrew and wipe off the exterior of the tube. Pointing the gun towards the booth or other waste container press the orange button marked (P) on the back of the gun to purge the current color form the gun. When no more powder exits the gun, place a box or container of new color on the shaker table at the base of the machine, loosen the thumbscrew holding the fluidizing/suction tube up and lower it slowly into the powder box. Shipping of your IntelliCoat gun is free to any business or residence in the United States and ships securely packaged in a wooden crate directly from our manufacturing facility. Estimated delivery time is usually only 3 to 5 days via FedEx. Assembly is fast and easy with color coded connections and clear cut instruction written in plain English are supplied. You will also be supplied with links to several YouTube videos to help get you started. IntelliCoat offers a full and unconditional 5 year warranty on all of its powder coating systems. If at any time during your warranty period you experience any trouble, simply contact us at 855-445-9660 for immediate help. Our technicians will walk you through a quick series of over-the-phone tests to quickly pinpoint the trouble and a fix is just a UPS truck away. Replacement parts and units are stocked in 2 locations in the U.S. and turnaround time 1 day on average. 6 months no payments no interest through PayPal. Simply choose the “Pay with PayPal Credit” button after adding your equipment to the cart for their best offer and credit a decision in two minutes.